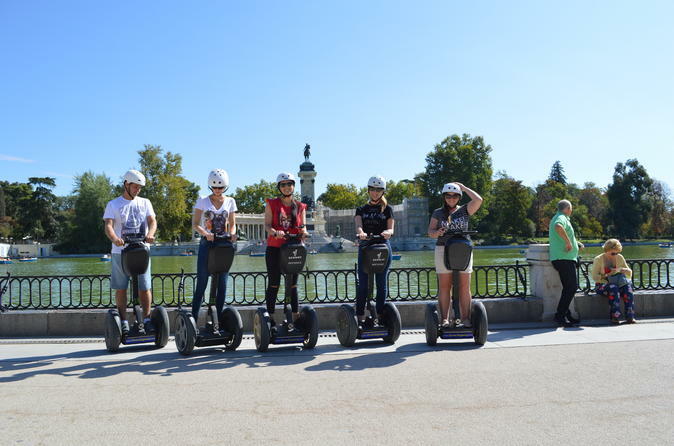 Retiro Park Segway Madrid tour is the best way to enjoy the green oasis in Madrid with more than 117 acres and 15000 trees along with French gardens and lakes. Its size and freshness makes it the perfect spot to visit on a Segway. Your local guide will take your small group on a 2 hour tour of the most beautiful scenery in Madrid. The journey will start after the training and safety briefing. Once everyone feels comfortable and ready, the tour will begin to El Retiro Park passing by the Plaza Mayor and admiring its traditional architecture. The tour will continue through Barrio de las Letras (Literature Quarter), where some of Spain's major literary figures used to live, such as Cervantes, the writer of Don Quixote. Through Calle Huertas and its lively terraces, you'll find Madrid's main museum and one of the best art galleries in the world, the Prado Museum. Here, you will also see the Church of Los Jerónimos, for some people the most beautiful one in Madrid, and the old palace of Retiro, whose gardens became the popular park. The tour will continue by crossing the Gate of Philippe IV, where you'll find the first of the french gardens with its curiously sculpted trees. Gliding through its wooded avenues, you'll get near the Fallen Angel Fountain, one of the world's few statues dedicated to the devil. You will also pass by a french style rose garden, a romantic crystal palace, and the Palace of Velázquez to see the jewel in the crown of Retiro Park, the lake and the monument to the king Alfonso XII. On the way back, the first monument after Retiro Park is La Puerta de Alcalá, the most important of the remaining gates from the XVII city wall. The tour will also pass by Cibeles Palace, the old financial district, and Puerta del Sol on our way to the Royal Palace, official residence of the Spanish kings. Nearby the palace is Almudena´s cathedral the newest Spanish cathedral. and in our way back to our office you will pass through the Plaza de la Villa the oldest Madrid City hall building.